A while back, I picked up a book titled “Booze Cakes“. The main reason being the booze being incorporated into baked goods and the second reason being one of the author’s names is Krystina, and hey, well that’s my name (spelling and all, but you do not have permission to call me that unless I love you). So I picked it up and read a lot of interesting facts. The main lesson I got from this book was, “If you wouldn’t drink it, don’t bake with it”. Very, very true. For instance, I have never baked anything with vodka because vodka is my enemy. Below is my take on their “Tres Leches Cake” soaked in rum (it’s on page 127 if you ever want to give it a go). 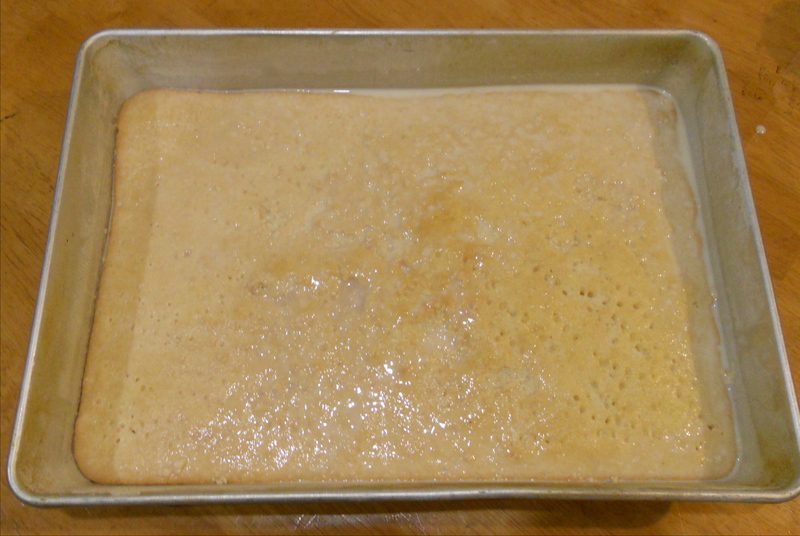 Preheat oven to 350 degrees F. Grease and flour a 9 by 13 inch cake pan. In a mixing bowl, cream butter and sugar 3 to 5 minutes, or until light and fluffy. In a separate mixing bowl, beat egg whites until stiff. Bake 25 minutes 30 minutes, or until a knife inserted in the center comes out squeaky clean. For the tres leches: Combine sweetened condensed milk, evaporated milk, and whole milk. Pierce the cake all over gently with a fork. Slowly pour the milk mixture over the cake (I stress slowly or it will all end up in one corner of the pan). Once the milk is completely absorbed (this takes a few minutes), pour the rum overtop (again, slowly). Refrigerate for at least 2 hours (after 1 hour it was still covered in a layer of rum). After 2 hours, it was still soaking in milk and whatnot. I ended up draining some of it out. You can also top this with whipped cream but I’m not a fan so I skipped that part. This cake stays very soft and moist (think of all the liquids you just poured all over it). Next time I will probably only use about 3/4 cups of rum. I like rum but I like plain ol’ cake, too. My lactose intolerance probably wants to punch me in the face after baking this but it was well worth it. It also slices very easily, just don’t attempt to transfer it to a different pan unless you slice it up first. This entry was posted in Baking and tagged Baking, cake, Rum Cake, Tres Leches Cake. Bookmark the permalink.